“The Harry Eichhorn* Pavilion.” Jack Bredin takes a new look at an OG landmark. “The Harry Eichhorn Pavilion” by Jack Bredin. January, 2019. Photograph by Rob Bredin © Click to enlarge. *Harry Eichhorn is an iconic figure in Ocean Grove representing the musical side of this town with its long musical heritage. There is a plaque on the Pavilion honoring Harry Eichhorn for his many years of conducting the Summer Band. You can use the search box at the top right of this page and type in his name. And, incidentally, Harry will turn 92 on January 29. 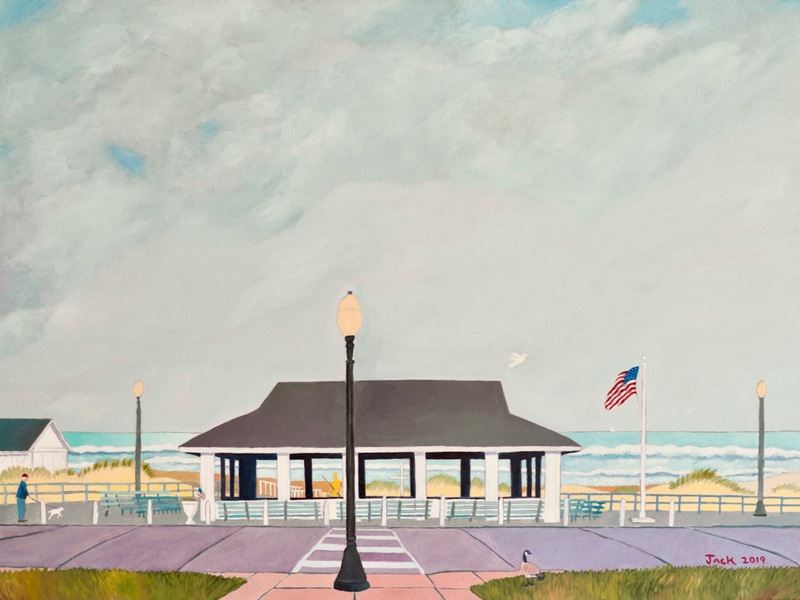 Editor’s note: Once again artist Jack Bredin of Ocean Grove creates a personal vision of an Ocean Grove view. His body of work is unique, as he redefines how we see our town. There was a time in 2007 when this Boardwalk Pavilion became a symbol of controversy where factions in the Grove clashed in an un-neighborly way. Instead, by naming this work “The Harry Eichhorn* Pavilion” he reminds us to look at our town with a broad stroke and to see it in all its diversity and beauty.